Tail rotor blades of helicopters have a definite service life of the order of 1000 to 1500 hours after which they are withdrawn from service. However, in many cases, the blades appeared sound with no external indications of deterioration. However, for extending the blade life, rigourous NDE checks are to carried out on them. Due to the varied type of materials used such as metals, composites, adhesively bonded regions etc., no single NDE technique is capable of inspecting the blade as a whole. A host of complementary NDE techniques are to be employed. At the authors laboratory, about 10 blades were examined non-destructively. Ultrasonics was used for the examination of the metallic portions including the area around the bolts, real time radioscopy for the metallic, honey comb and composite regions and thermal imaging for adhesively bonded regions. This paper, details the methodologies and procedures developed at the authors laboratory. The tail rotor blades of helicopters used in defence industry have been given a total service life of the order of 1000 - 1500 hours of operation respectively. The time between overhaul of the helicopters is about 1000 - 1500 hours depending on the type and model of helicopter. Thus, the tail rotor blades are discarded within one cycle of overhaul life of these helicopters. No failures had been reported on these blades during their assigned life. Even after completion of the stipulated service life, most of the tail rotor blades were found to be sound with no indications of geometrical deterioration or material failure. It was neccesary to identify and formulate the NDT methodologies and procedures to be adopted to inspect the blades for necessary grant of life extension. For the purposes of initial examination, a total of ten blades were received, of which one was new and the others had completed different amounts of flying hours ranging from 100 - 1500 hours. A typical tail rotor blade of helicopter (Fig. 1) has steel brackets for mounting, a spar of aluminum alloy, trailing edge made of honeycomb structure with fiberglass cover and a rib of aluminum alloy at the end. It was necessary to ensure the structural integrity of the SPAR region, examine the bolt holes and also ensure the integrity of the honeycomb regions. Since the blades were used, the possibility of delaminations in the GFRP skin could not be ruled out. Due to the varied type of materials used, such as metals and composites with a glued portion in between, no single NDE technique is capable of ensuring the integrity of the blade as a whole. A host of complementary NDE techniques are needed to be employed. Based on the nature of the material and its criticality, it was decided to adopt ultrasonics for the examination of the metallic portions including the area around the bolts, real time radioscopy for the metallic, honey comb and composite regions and thermal imaging for adhesively bonded regions. Ultrasonic pulse-echo normal beam examination was carried out on the bolt regions from the flange side. Ultrasonic flaw detector model ESM-2M with normal beam transducer of 3.5 MHZ frequency was used for testing. The test parameters used are given in Annex- I. Suitable equipment conditions were selected to get 80% back wall echo from the bottom of the bolts. Presence of any intermediate echo indication or loss of back echo was taken as the criteria for defect indication. Real time radioscopy was adopted on the tail rotor blades. The advantage of real time radiography is the possibility of online examination and also object manipulation during examination. For field conditions and especially when a number of such blades is to be examined on a rotuine basis, RTR is definetly a better suited field technique. A portable 200 kV air cooled X-ray unit was used along with an image intensifier system. Fig. 2 is the photograph showing the setup for real time radiography. The details of the equipments used and the radioscopic parameters are given in Annexe - II below. The X-ray beam was collimated to the region of interest using a remote controlled lead shutter. This also helps in reducing the scattered radiation. 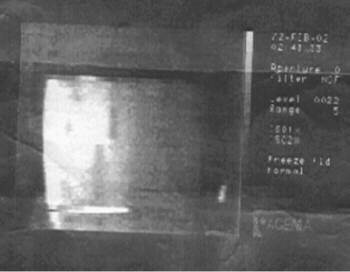 The raw radiographic images from the image intensifier were integrated over 64 frames to remove the noise. The images were then contrast stretched, spatially filtered and edge enhanced for better defect detectability. Different energies were used for different regions of the blade to obtain the required contrast and sensitivity. Wire type of penetrameters were used. Thermal imaging or thermography or infrared imaging makes use of the infrared band of the electromagnetic spectrum. The technique of thermography finds extensive applications in condition monitoring of electrical installations, petrochemical and steel industries and also for energy audit. This technique is now finding increased applications in the areas of materials characterisation, especially for the detection of defects in composites. The main advantage of thermal imaging is that it is a non contact method and the technique is reliable and safe and provides a instantaneous visible image of the area scanned. The technique was first standardised on a cut blade with artificially created delaminations defects received from NAL, Bangalore. The various bond defects created in this cut section are given in Fig. 2. Active thermographic technique was adopted. The temperature differentials were created using specially designed hot air gun heaters. Both single sided and through transmission modes were adopted. From the thermal patterns of the hot air guns, it was observed that the heat output had a non uniform distribution. Suitable cones were then designed to concentrate the hot air flow. The areas examined in the actual tail rotor blades include the composite region and also the glued regions. Fig. 3 is the real time radioscopic image of the honeycomb region and the glued portion. The variation in the glue can be clearly seen on the integrated image. Radioscopic examination in general revealed the presence of minor porosities in the glued portion and small variations in the position of heating elements. Except in one blade where a linear indication was seen, no significant defects were observed in all the other tail rotor blades by ultrasonics, radiography and thermography. The linear observation detected by RT could not be detected by UT due to the geometry of the configuration. 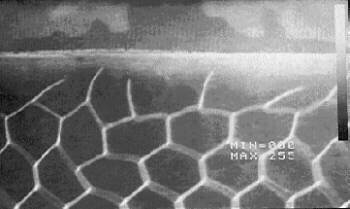 The length of the defect was observed to be about 2 mm by radiography. Fig 3: Real time radioscopic image of the honeycomb region and the glued portion. In the case of the cut blade with defects, thermal imaging could detect most of the defects with a temperature gradient of about 2 to 3 degree Celsius. Thermal chopping and image processing techniques such as spatial filtering were applied to smooth the images and thus improve the contrast and increase the defect detectability. Fig. 4 shows the thermal images of the cut section. The various defects detected are indicated by arrows. Tail rotor blades being complex structures with a variety of materials used for fabrication require a host of NDE techniques for evaluating their structural integrity. A methodology has been established for the examination of these blades using radioscopy, ultrasonics and thermal imaging. The sensitivity achieved by real time radioscopy with image processing was equivalent to film radiography. The techniques have been so chosen that they can be adopted at the site where the blades are available. In the present campaign undertaken, no significant indications were detected by these techniques on nine of the blades. This indicates the possibility of extension of service life from the present 1000 or 1500 hours. Such an extension would help in utilising the good blades and also save the national exchequer valuable foreign exchange. The authors are grateful to Dr. Placid Rodriguez, Director, Indira Gandhi Centre for Atomic Research, Kalpakkam for his keen encouragement and constant support. The authors thank Shri V.Manoharan and Shri P.Balaraman of the Division for PIE & NDT Development, IGCAR for all their support during experimentation. The authors are also grateful to Air Marshall S.S.Gupta, Air Marshall P.K.Ghosh and members of the task force formed for the life extension -Group Captain P.K.Desai, Dy SMSO, Air Commodore Agarwal, AOC, 3BRD and Group Captain O.Bhattacharyya, Dr. B.N.Parida and Dr. K.K.Brahma for the very useful discussions.